According to my father-in-law, it's all the same. 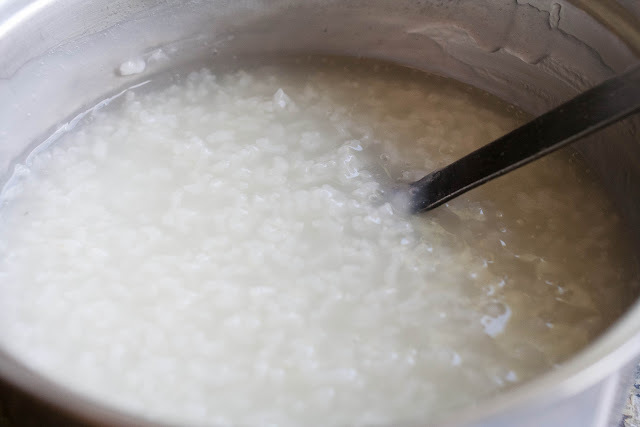 Japanese soft rice or porridge. My mother used to make this when we'd get sick or didn't feel well, and that's what I made for my children when they were sick, too. 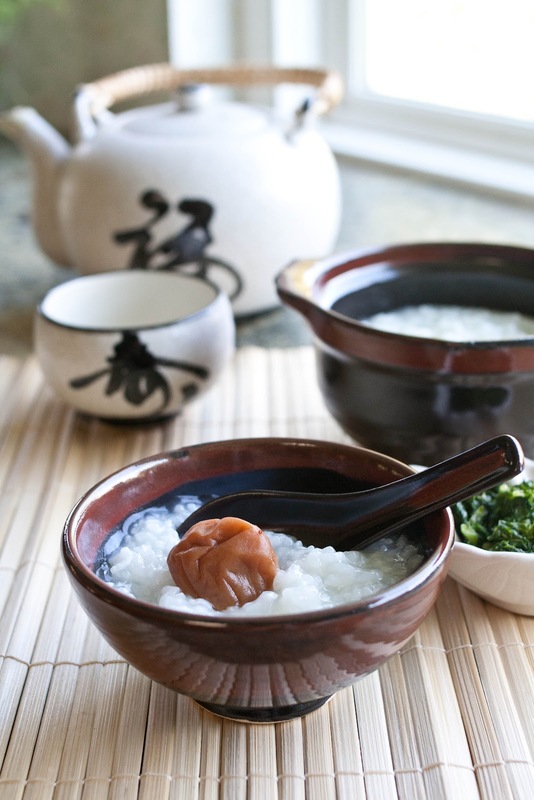 Japanese American comfort food in it's simplest form. 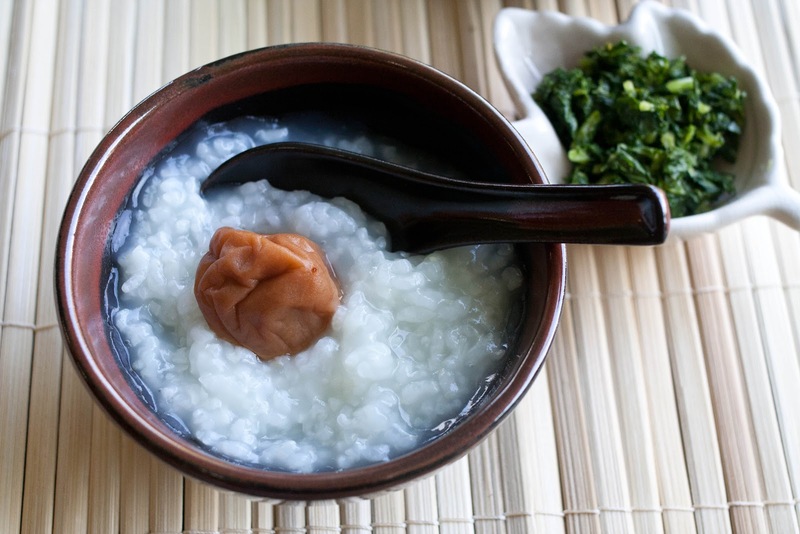 My mother always served it with an umeboshi, a pickled plum. 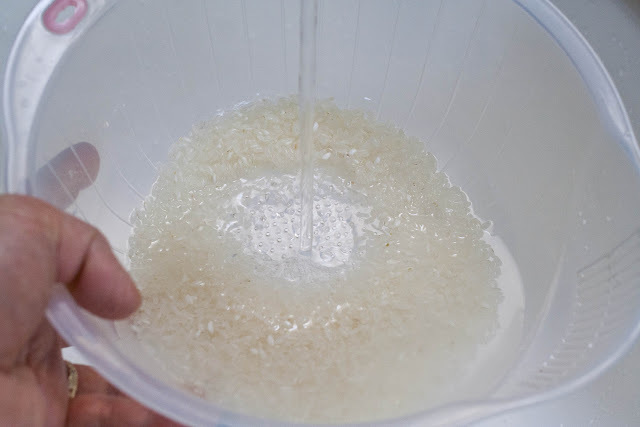 All you need is rice and water. 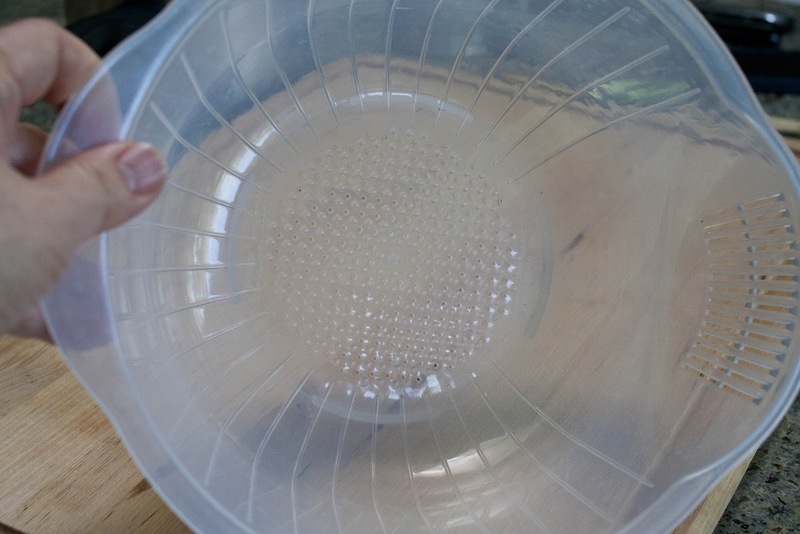 This is a bowl specifically for washing rice, it's got little holes in the bottom and slats on the side that make it easy to pour off the water. A wire sieve works fine, too. To make a small pot of okayu, use 1/2 cup short or medium grain rice. 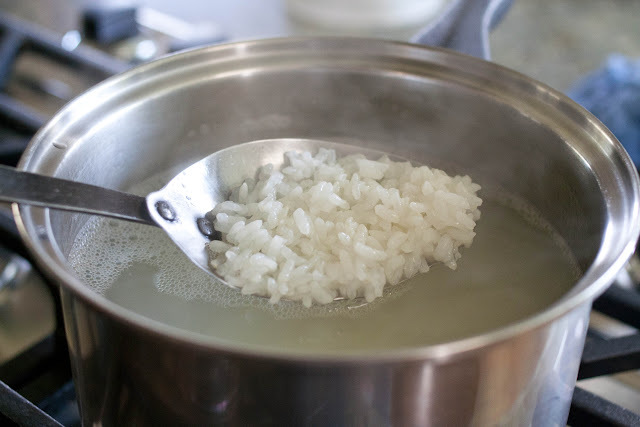 Put the rice into a pot with 4 cups of water and bring to a boil. You can also make it with left-over rice. 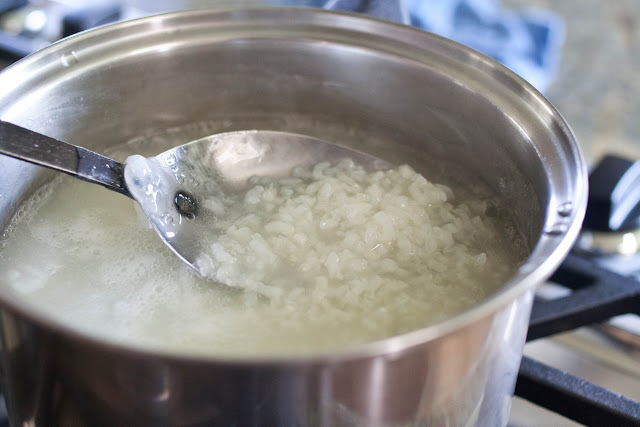 Just add water to the cooked rice and boil. It's not necessary to skim off the foam. 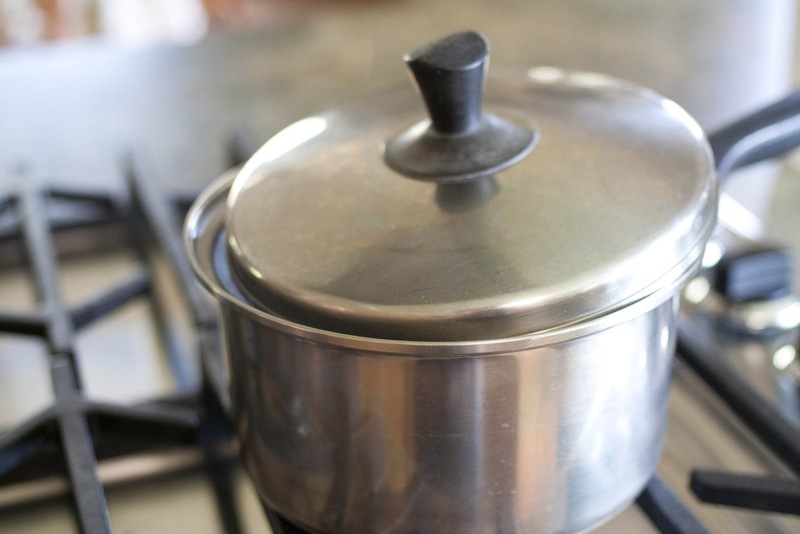 After the rice comes to a boil, lower the heat to the stove's lowest setting and simmer for 30 minutes. Crack the lid so the water doesn't boil over. That can make a mess. After about 15 minutes, it looks like this. Not done yet, but getting soft. 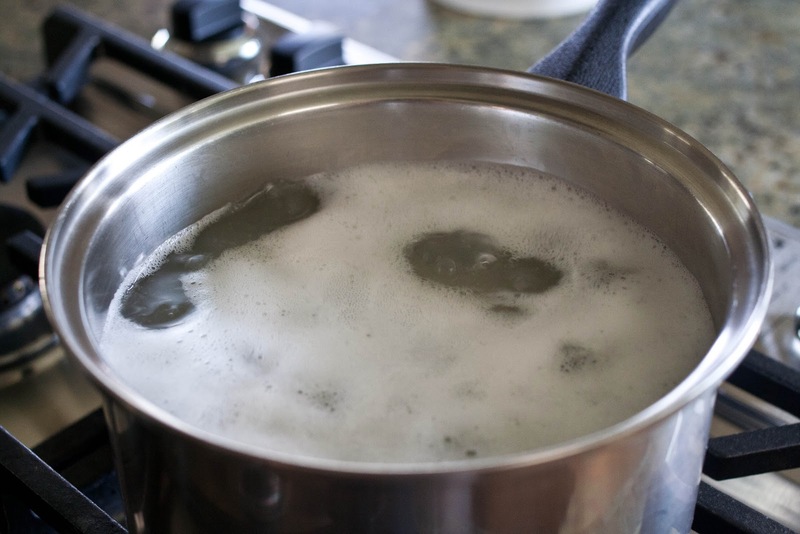 Stir the pot occasionally to be sure there's enough water and so it doesn't burn on the bottom. You can see it's starting to get thick. When my kids were little, I'd make okayu for them for breakfast and add a can of Campbell's Chicken Noodle soup. 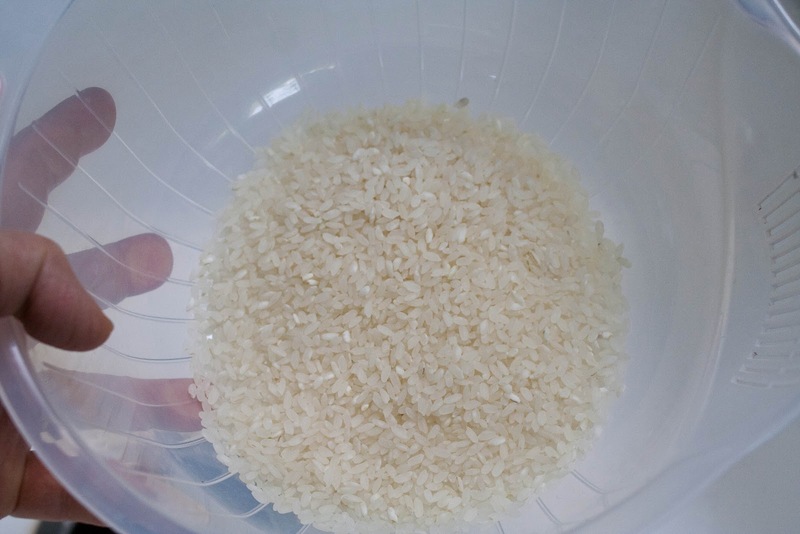 After 30 minutes, it's thick and the rice starts to break up. You can add a scoop of okayu to your misoshiru. I like it like that. Or you can add some dashi, chopped leftover chicken or fish, tofu, some minced veggies or a beaten egg--any of those things will jazz it up. But sometimes you just want it plain with salt. You want it to be really soft but still individual kernels of rice. My mother added about a half-teaspoon of salt, just enough to give it a hint of saltiness, because the umeboshi is salty. If the okayu sits for a while, it will get thick. 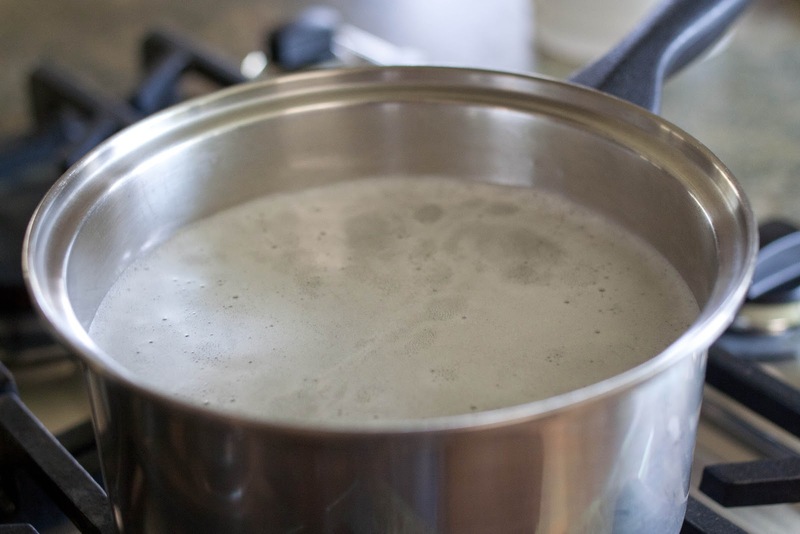 When that happens, simply add a little water and stir it up until you get the consistency you like. I serve it with a little o-cha. And some salted turnip tops that I made from the turnips my dad grew. When I was a little girl, I remember watching the Olympic Games with my dad. He was cheering for Japan--the athlete on the rings, in men's gymnastics. I didn't feel Japanese. I felt American. Kids made fun of me because I looked different than they did. They'd pull their eyes tight and say 'Ching-Chong'. Not a lot. But enough. When you're little, it's hard to understand. My grandparents were Japanese, they spoke Japanese. We spoke English at home, and from what I could see, we were the same as our neighbors. We just looked different, but so did they. Some were blondes, some brunettes, some had freckles. My friend's dad had a tattoo on his arm and a naked lady on a calendar in his garage. But we weren't the same. We had the Japanese community. I didn't understand it until I got older. 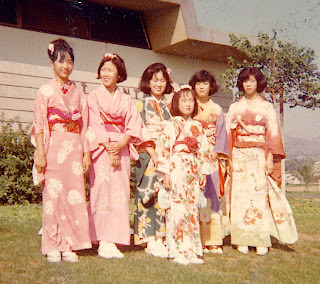 I went to Japanese language school, did Japanese dancing, odori, at community center picnics and made friends that were Japanese Americans, like me. I learned about what my parents and their friends called 'camp', the Japanese American internment during WWII. The same girls I went to Japanese school with are the same girls I did Japanese dancing with, and we're still great friends today. We have a unique shared experience. A friend and I traveled to Nagoya, Japan, several years ago. While we were walking back to her house from the train station, a woman, a generation older than me, stopped me. She said she had heard us talking, her hobby was studying English so she understood us a little, and was curious. "You look Japanese, but I can tell from your speech and mannerisms that you are not. Where are you from?" "I'm from Los Angeles. A-me-ri-ka-jin desu." The friend we were visiting said that is unusual. People don't stop you on the street to ask you something. Japanese people respect each others' space and generally won't intrude upon it. It all kind of came together for me in that instant, and I learned a lot about myself and people in general. 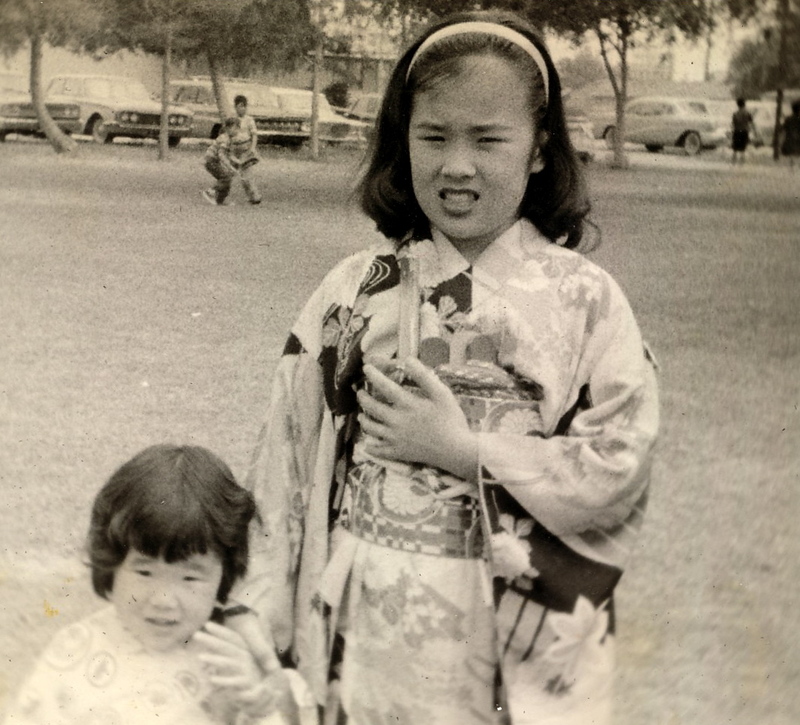 I know that I am uniquely Japanese American. The things I think of as Japanese are old-fashioned in today's Japan, since they come from my grandmother's time, pre-WWII. 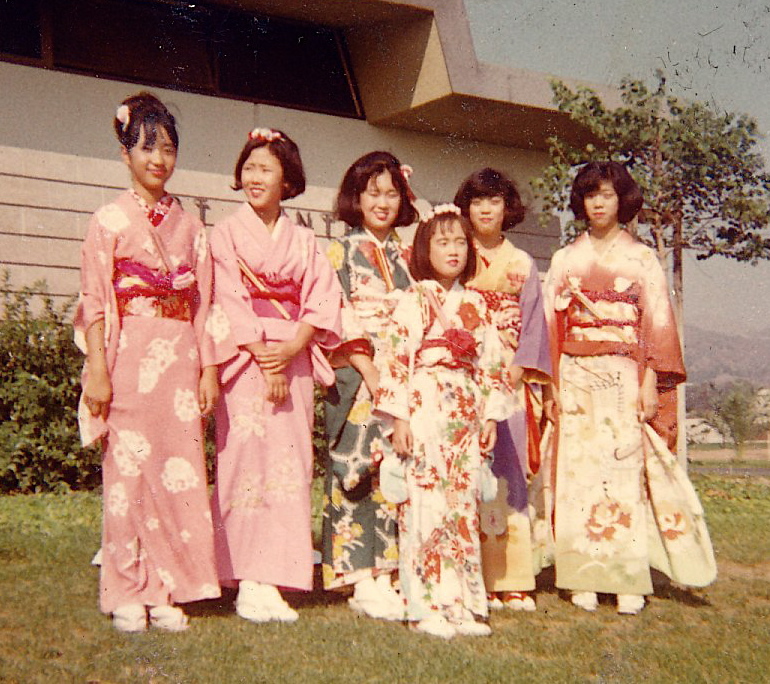 I know my grandparents came from Fukuoka, Japan, but I don't know of any relatives there on my side of the family. But I am Japanese enough to want to make okayu as comfort food. Our thoughts and prayers go out to the people of Japan. Love the pictures, you all look beautiful. I have a friend who will say to me, jokingly, "I know a Chinese, and it's not you." All well and good with me. My mom always made this for me when I was young too!! She always served it with a small bowl of soy sauce with sesame seeds in it and we dipped each spoonful into the soy sauce, it was so nice. wow, i haven't thought about that rice porridge for a long while now. In Korean it's called joog/jook as well. I made this and wrote about it here. Thank you so much for posting this recipe. I've lived in Japan for over a decade but never made okayu, preferring homemade chicken noodle soup. Made that yesterday and it didn't work, so I am finally trying okayu thanks to you. It's on the BRAT diet (bananas, rice, apples, toast) so hope it fills my kids' tummies and makes them healthy. 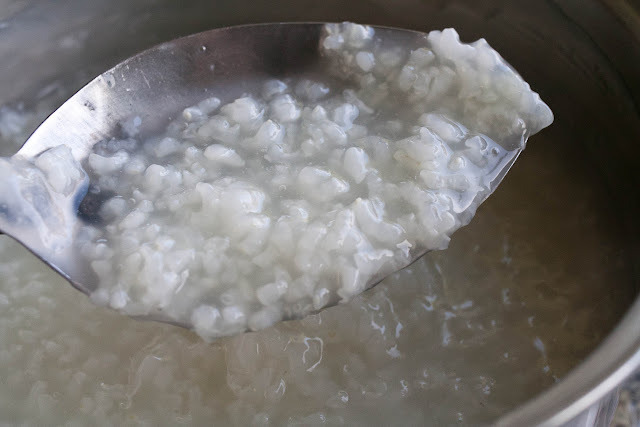 In looking for a recipe for oyaku I discovered a lovely blog. Thank you for sharing the recipe and the stories. Hi, I found your blog while looking for an okayu recipe. My mom always made it with eggs in it. 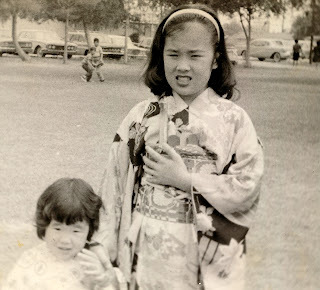 I am a Sansei, grew up in L.A. and I went to J-school too! Every Saturday, ugh. Even went to J-school junior high. I can still write in hiragana, but can't speak it very well. I'm glad I found your blog, we have a lot in common. I had the Korean version of this dish. I liked it very much. My comfort Japanese food was ochazuke. Never got tired it. My experience in Japan was great. I was stationed there while in the Navy. I thought it was funny that Americans call me Japanese while the Japanese call me American. I love your little story at the end. I feel the same being half Kiwi, half Japanese. And thanks for the recipe!! I went to Japanese school too, everyday after regular school and on Saturdays too. I really didn't know why I was going to two schools at once, I just had a whole lot more homework and in a language that was different from what the kids at regular school spoke. 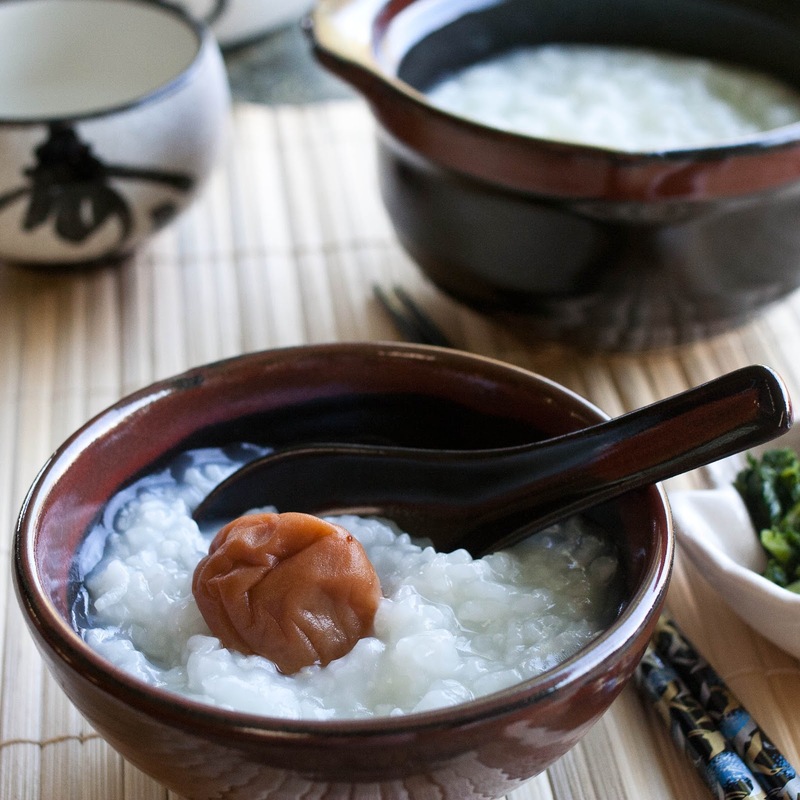 I miss eating my Mom's oh-kaiyu, It made all the difference in the world when I was sick. She too made it with umeboshi, I know, it is an acquired taste. But I got it right away and that mouth puckering flavor cured whatever was wrong with me. I ate my oh-kaiyu with tsukemono, dried bonita and nori. I live in Pennsylvania, and there isn't much Japanese food here. However, there is every heart attack food you can dream of here. And it is considered 'health' food, as Pennsylvanians die every year from strokes and heart attacks. While it is tasty, I'm not ready to die just yet. I'm too much of a Japanese I guess. BTW, the dried bonita was called katsuo by my Mom.